Kielder Water & Forest Park and Hamsterley Forest transform into the deep dark wood, with the installation of brand new Gruffalo character sculptures. 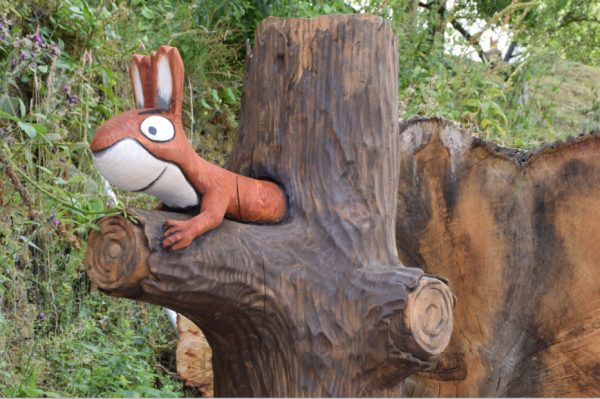 As part of the ongoing relationship with Magic Light Pictures, Forestry Commission England is bringing the world-famous tale to life through sculptures of characters from The Gruffalo’s story across fourteen forest sites in England. Mouse, Fox, Owl, Snake, and Squirrel will join existing Gruffalo sculptures at Kielder and Hamsterley Forest from Thursday 23rd November. Wood used to create the sculptures includes timber taken from the renowned Old Man of Kent which was the country’s tallest tree, located at the Forestry Commission’s Bedgebury Pinetum. The Old Man had to be felled last year due to disease and wind damage, and has now been given a new lease of life, taking shape as the favourite characters from the book written by Julia Donaldson and illustrated by Axel Scheffler. Visitors will be able to seek out the story characters from trails starting at Kielder Castle or Hamsterley Forest visitor centre, and set their imaginations alight on their own Gruffalo adventure. All the sculptures have been created by master chainsaw carvers at Woodland Centre Ltd in West Sussex, and hand coloured with wood stain, before being installed in the forests.